His Holiness the Sakya Trizin, Dhakpa Rinpoche, and Lama Zopa Rinpoche during Wangya Norbu Tangwa initations, 2008. When one receives an oral transmission (lung) or initiation from a qualified Buddhist master, one is receiving the teachings of the Buddha in their original form, passed perfectly from master to student through generations in an unbroken continuum. The Preserving the Lineage Fund provides the means through which the Mahayana teachings can be transmitted from Tibetan lamas to their students by sponsoring initiations and oral transmissions which Lama Zopa Rinpoche has identified as essential for the preservation of the Dharma. What is an Oral Transmission? An oral transmission, or “lung,” is when a Buddhist lama recites aloud a text for which they hold the lineage, (meaning, the lama has received it properly from a previous qualified lama). Students who hear the entire text is considered to have received the oral transmission of the text. This occurs in an unbroken continuum, ultimately going back to the author of the text. 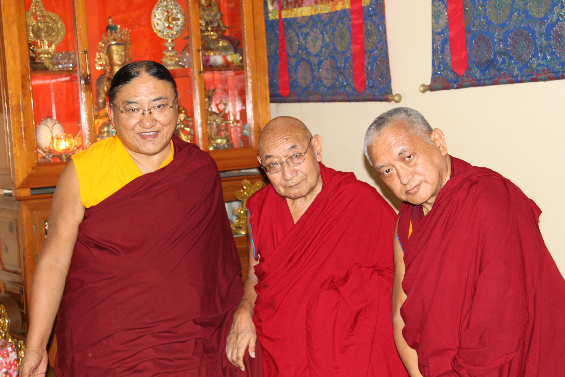 His Holiness the Sakya Trizin, Dhakpa Rinpoche, and Lama Zopa Rinpoche during Wangya Norbu Tangwa initations, 2008. The aim of the Preserving the Lineage Fund is to cover all expenses that are incurred during specific transmissions that are deemed imperative by Lama Zopa Rinpoche. These expenses can include the sponsorship of events when oral transmissions are given, including food and offerings, and the preservation of specific teachings in any form. 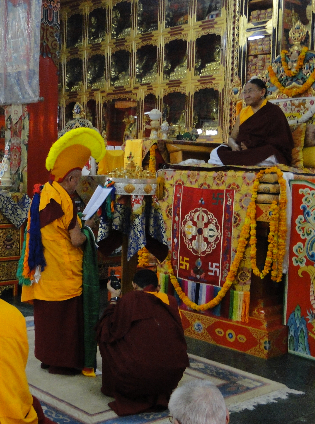 Through supporting these transmissions given by qualified Tibetan lamas, the fund helps FPMT fulfill its primary objective: preserving the Mahayana tradition. Please read a short update, with beautiful photos, of the 2012 Wangya Norbu Tangwa initiations held at Sakya Centre in Dehradun. The Preserving the Lineage Fund would like to acknowledge the incredible generosity of two extremely kind benefactors from Singapore who have sponsored almost the entire costs for the Wangya Norbu Tangwa initiations with His Holiness the Sakya Trizin for three years. Or simply send your check in US dollars payable to FPMT Inc. and write “Preserving the Lineage Fund” on the memo line. The Preserving the Lineage Fund is a project of FPMT Inc. All donations made to the fund are tax-deductible within the United States in accordance with IRS Code article 501(c)(3) to the extent allowed by law.